One of my favorite stories — ever — at MPR was this masterpiece from Dan Gunderson back in 2001 about a group of people who square-danced with tractors. This zany dance troupe is Bill France’s brainchild. An avid square dance caller for years, he convinced the local antique-tractor club to try dancing, and using blocks of wood on his kitchen table. He worked out the logistics of adapting square-dance moves to tractors. There is one small concession. France took out all the dance moves that require dancers to back up, because it takes too long to shift the antique tractor transmissions. Seems the designers didn’t have dance moves in mind. Apparently, it’s a dying art form. The Associated Press (via the Worthington Daily Globe – reg. 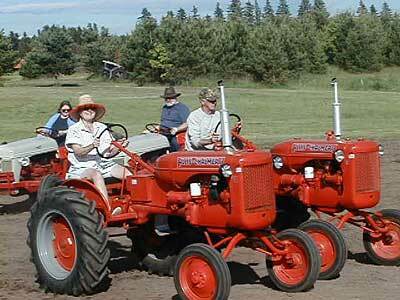 possibly required) has announced the end of the Farmall Promenade Square Dancing Tractors. No subscription required to view within 7 days of publication [14 April 2008]. The dancing tractors are another victim of rising gas prices, as it’s expensive to truck them to performance locations. Looks like they perform mostly in Iowa and Nebraska. Might be nice to have them in MN for Sesquicentennial Celebration, but we’re probably to cheap to bring them here. Besides, the female ‘dancers’ are men in drag. Minnesota is Where the Women are Strong; NOT where the women are men.